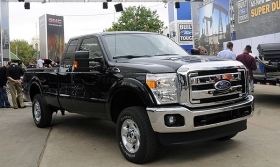 The Ford 2011 Super Duty pickup will have a new body, Ford's first in-house designed diesel V-8 truck engine and a new six-speed automatic transmission. DETROIT -- Ford Motor Co. has designed a new transmission for its 2011 Super Duty pickup that will achieve “significant” performance and fuel economy improvements over the current five-speed automatic, a top Ford engineer said today. The truck goes on sale next spring. It will have a new body, Ford's first in-house designed diesel V-8 truck engine and a new six-speed automatic transmission. The EPA does not require fuel economy estimates to be given on the window sticker because heavy-duty pickup trucks are in a different weight class and do not have to conform to passenger-car standards. Ford will announce more details on the fuel economy of the truck as it gets closer to launch. Derrick Kuzak, Ford's global product chief, has committed Ford to fuel economy leadership in every segment. But engineers stopped short of saying the 2011 Super Duty trucks would top General Motors and Chrysler products' fuel economy. Ford can use the same base transmission in gasoline and diesel trucks. Ford engineers benchmarked the GM Allison transmission used in heavy-duty versions of the Chevrolet Silverado and GMC Sierra. Ford's new transmission uses a one-piece case that saves 25 pounds compared with the GM transmission that uses a three-piece case. The transmission has two novel features. It can be made to mimic a manual transmission. It also has what engineers call a “live drive” power takeoff. That enables auxiliary equipment, such a salt spreader, to be used while the truck is stationary.